Even if they may be genDESIGN now, The Last Guardian is a Team Ico game through and through. It takes what it learned from previous entries Team Ico fostered amplifying them generously. The Last Guardian knows that it’s a game about boy and beast, following suit of Shadow of the Colossus. Trico isn’t just any ol’ beast though, Trico is more familiar than most would ever realize, and The Last Guardian created a character anyone can fall in love with (unless you don’t like animals). Think of this as a love letter to Trico and the animals in our lives. Now that Trico is truly unchained and free for all of us to share, it’s easy to see why such a common thread seems to keep coming up for this game. Trico looks like everyone’s pet. Seriously, look Trico in the eyes and tell me there is not only the most unconditional love a pet can give. Trico is relatable — his/her (hmmm…) actions are familiar to anyone that has had a pet in their lives. Trico is astounding because of the mish-mosh of animals that make up this loveable beast. Who knew that it would be so easy to love a bird-dog-cat that is way too big for cleanup duty? On a personal note, I immediately experienced this feeling upon booting up The Last Guardian. The wave of emotional connection that Trico dishes out pulls hard on the heart-strings. It’s in Trico’s movements, in the way Trico can be as stubborn as an ox or as playful as a housecat. Trico’s stubborn attitude reflects perfectly the air of superiority that only a loving pet can give. “Hey, Trico, please come over here…. please? !” Alas, Trico will do Trico. Trico is not all just stubborn attitude, though. Trico seeks attention always, making the experience all-the-more wonderful. The Last Guardian presents the classic moment of “Hey what are you doing, I’m going to be in your way”, that anyone familiar with a dog or loving cat knows all too well. The difference being Trico is freaking huge. 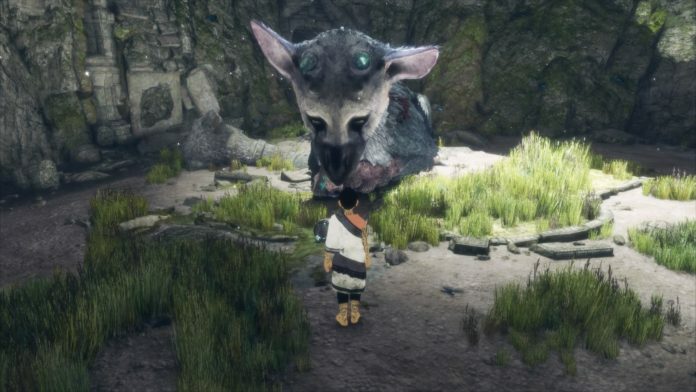 Normally the idea of something being giant makes me uncomfortable, but with Trico I never was scared; cautious, but never scared. Of course, it’s smart to be cautious with any animal, especially if trying to bound while becoming familiar with it. A mythical creature is no different. Characters are a big part of just about every game, but having a character with no dialog that’s also an animal is a feat all its own. 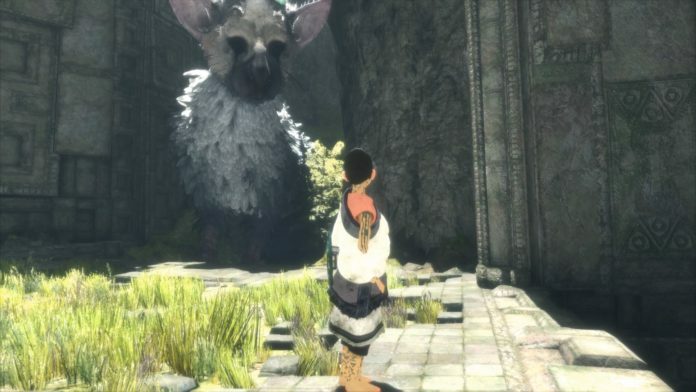 The Last Guardian at times doesn’t feel like a game: it’s more about the interaction happening between companions while nurturing a budding relationship, which probably accounts for the fact of why Trico comes across as so trusting. Yes, it is a video game and they designed Trico a certain way, but technicalities aside, Trico is familiar. The push-pull of the relationship is cemented firmly in interactions players have with their own animals. This air of comfort throughout the game is what makes it impossible to not care for Trico. Not even the boy could abandon him, even when he first wants to. Understandably, waking up in a cavern with a chained beast unfamiliar would make me want to go home too. Trico also comes from a place ripped straight out of those Sarah McLachlan animal cruelty commercials, “No! Please don’t spear him, I’m calling right now!” Obviously seeing animals in pain/distress is never fun, and even seeing these things in media makes me hurt. In turn, playing a game where not only do I have to take care of this beast, but also want to become its friend makes it difficult knowing the journey will be tough. Some of the moments in this game are gut wrenching, making me want to pull my own animals closer towards me while playing. There is a certain scene that comes to mind in The Last Guardian that is especially defeating. Even with the journey being rough at times, for the most part it’s just fun romping around ruins and playing with Trico. I could easily loose a day to actually wanting to ride around on a giant bird-dog-cat. Trico is by far the most lovable character to come out in a long time. 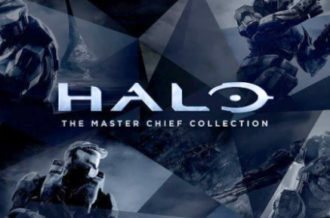 Let’s just pretend the egg was incubating for the many years this game was in development. Trico, you are truly an amazing beast that deserves only the utmost respect and love; luckily you have a lot of people willing to share in that love. Thank you, for the wonderful journey and a bond worth cherishing.